Have you seen our free e-book – 71 Ultimate Marketing Tools? Thousands of people have downloaded it. People get good stuff from it and that is called a lead magnet. So if you go there, to check it out, I am giving you something in exchange for you giving me permission to market to you. By giving me your name and address, I will give you a free great book which has the 71 marketing tools that me and my team and my staff use every single day to create a business which now has over 105,000 paying customers. Yes, you heard that right. Not just people, not just sign ups on some email list. Paying customers. By the way that’s not this one. So that is a lead magnet because by me offering you something great, you want it. In exchange I am then going to send you some emails. You are not going to get any hard sale. You will see, the best thing is to see. Just, don’t be scared. You can unsubscribe if you want because every single one has an unsubscribe button. It’s all done professionally, it’s all sent by a service called aweber. It has a professional unsubscribe at the bottom, nothing I can do about it. If you don’t want to see emails from me ever again, I can’t email you. Clever eh? But if you stick with it, you’ll find over a period of weeks and weeks and weeks that the information I share with you is simply amazing. So there are many example of lead magnets, it does not have to be like mine. So this is our weekend challenge. 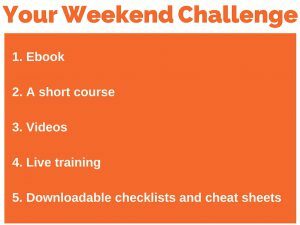 Every Friday I give a weekend challenge. Today is a simple one. It’s the most common. And so it’s the easiest to make. However by being the most common, it means it’s common. It has to be special. It has to be good. It has to be something that moves your potential customer from knowing nothing and not really trusting you, to know more about what you do, or the service that you provide. Not necessarily, just what you provide, the type of service you provide, and starting to trust you and starting to think, ‘Gosh, you know what you’re talking about. You’re an expert. I’ll listen to everything you’ve got to say’. See what I mean. So in ours it’s not just a download that took 10 minutes to create or that we just borrowed off from someone else, or stolen off someone else. With our eBook, we paid a designer. It’s very nicely designed. It’s well presented. It’s all carefully formatted. We have added all the links, it doesn’t just tell you what tools, it gives you a link to get to the tools. Virtually every single tool in there is free. And it gives you a logo, what to look out for and it gives a little summary of a ‘Why, we like it’. Not just a list. So we went to that extra degree. This did not take 5 minutes to create. Now I can’t remember how many pages but pages is pretty much insignificant, depends on how big your font is, yeah. How big your text is and how big your pictures are. So, it’s bit of a good size. It is a good size book, you could print it out. It’s going to be helpful for people. That’s what I recommend. Now generally, you want a five or seven day short course by email. Pretty simple, this again very very simple. If you provide a service, then you need to teach people how you do that service. They are not going to go and do it themselves. So, let me give you an example. There are cooking programs on television, such as Master Chef. Gordon Ramsay shows us how to put a restaurant together. Jamie Oliver shows us how to do his stuff. But you still go and buy his books, don’t you? You still go to restaurants don’t you? You still want to go to a Jamie Oliver restaurant. You still want to go to Gordon Ramsay restaurant. You see what I mean. It just shows you that they are fantastic, and then you want to experience the real thing. So put together a 7 day email course. So, when someone signs up, they get one email a day. This is all done with an auto responder. It’s all automatic. If you want to know good auto responders, go to www.marketingforowners.com/tools and you’ll find resources. In fact in my eBook that I mentioned earlier, you’ll find the ones that we use and the ones that are recommended in that report and the links to them. We use two services — Aweber and Mail Chimp. You’ll find the link and you’ll find which one I prefer and why I prefer it. Okay? So that was the second one. I like the eCourse because people like to learn. It shows that you are an expert. How to, videos are a great lead magnet. If you’ve got something that can be demonstrated, such as recipes, if it works on T.V, it works on video. This is, if any of you are watching this on the video, on the website, or on YouTube, you can see. I can talk to you and explain how to do something. These are like ten minutes. Really no big deal and you may notice, I add lib. There is no script. I’ve got a note of the 5 things here and that’s just in case I forget one, because I have come down by the golf course. And If I forget, it’s quite a hike back, back home. But it’s that easy. It’s not very professional — and I am recording this by the way with my iPhone 6. Nothing special. I have a little microphone and I have a tripod. If I can do it, anyone can do it. Don’t give me excuses. A how to series. So show people how to do something. You can do it via a webinar, via Google hangout or hangout on air, or you can do a webinar using GoToWebinar, WebEx, that kind of thing. There are many programs that do this and provide all the service. Just look up online webinars. GoToWebinars is most common. Now it costs money but it does it properly. And if you’re doing this well, the money is worth the expense. You spend money to advertise, this is getting people that are very very targeted. Call it masterclass, study, free study, anything. People love to be taught stuff. This afternoon, I just watched a two hour one for free, from about stuff that I already know about. I had nothing to do. There you go. It was good. People will sign up for those. If you write a big blog post, make a summary check list, a cheat sheet, the short version and just put half way down, ‘Grab the cheat sheet’. People sign up. They enter their email to get it downloaded to them. Yeah don’t just give it away. Get it sent to them so they’ve got it on record. Simple, eh? People haven’t got time. People want cheat sheets. We use this a lot. If you go to www.marketingforowners.com/guides, we have about 40 for you to download. These are remarkably easy to to create. You’ll be surprised how little they’ve cost me to have created. But they are good, they are very popular. And I know I have said 5 but I love over delivering. Those of you that follow me any time, know I’d love to over deliver. White papers have more in-depth studies, more detail, more highbrow of what you are selling. That kind of thing, very informative. Just look up and google ‘white paper examples’. It’s easy. 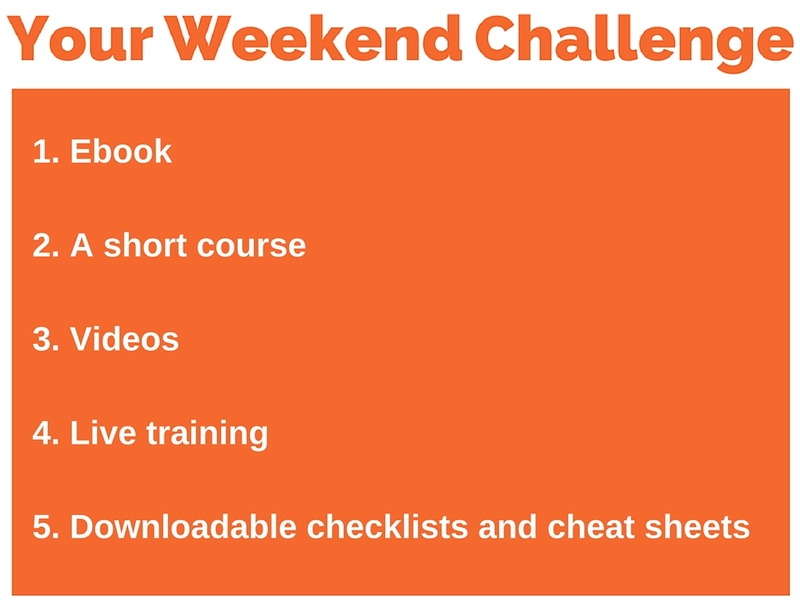 And that’s your weekend challenge. That’s all you have to do. There will be another one next Friday. There will be another one, the Friday after that. But for now, you have yourself a super Halloween weekend. And I’ll see you next week, where we’ll not be discussing pumpkin recipes. Okay. Have a good weekend. 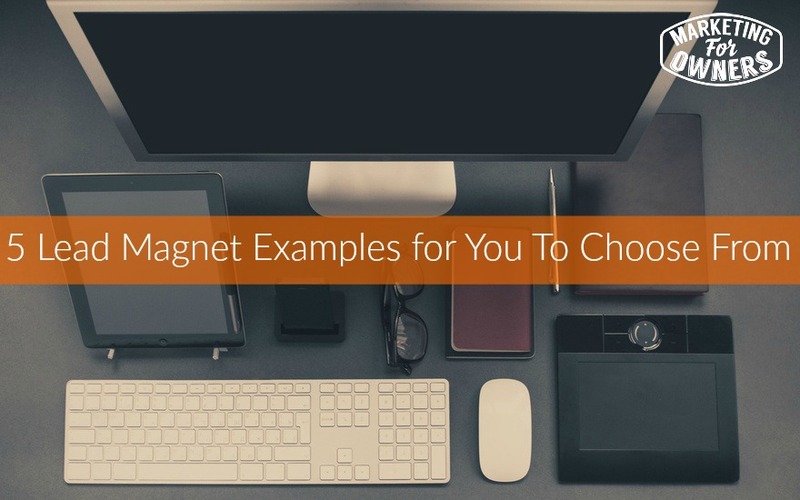 Which lead magnet is the one that will work best for you?